I have never been particularly strongly for or against unions. I knew that they had played an important role in creating a more humane workplace – 40 hour work week, child labor laws, work safety standards, Social Security, work benefits, and so on – but just had not considered why a strong union presence in the economy was so important today. I was also aware of some of the ways unions had abused their power in the mid-twentieth century by excluding racial minorities in the early. I also remembered that the Teamsters had been used by California growers as thugs trying to intimidate the Farmworkers in the 1960’s and 1970’s. So I knew unions served a purpose, but I also knew they were not made up of angels. Then the Miracle of Madison occurred, when Wisconsin governor Scott Walker not only sought to reduce the benefits paid to public employee unions, but also wanted to take away their bargaining rights to advocate for themselves. Scott Walker found out that his “mandate” was not as strong as he had imagined. The people have stood up to the governor for three weeks now, and the power of their movement grows each week. As I said in my last blog posting, to take away people’s bargaining rights is to rob them of the very tools of democracy. These events have gotten me thinking about what happens when unions aren’t allowed to operate. I have been reminded of how union jobs in places like Philadelphia were moved to the South and then to Mexico. Now in the Maquiladora area around Juarez, Mexico (just across the river from El Paso, TX), people work for $5-15/day in unsanitary and unsafe conditions for major corporations trying to escape having to pay living wages and benefits, and other work-related items that we in this country take for granted. There are no unions in Juarez and the conditions are not only horrible, they are patently inhumane. All in the name of profit and capitalism. 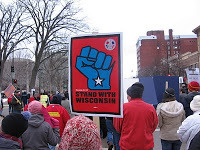 This past weekend I was in Madison, WI and marched around the capital with school teachers, firefighters, Teamsters, grandmothers, elementary school kids, and representatives from just about every other slice of humanity currently living in Wisconsin. I happened to be there when filmmaker Michael Moore showed up and delivered an incredible speech putting the Madison conflict in the context of a larger class war. His Major point was that Wisconsin, like the United States is not broke; it’s just that a very few millionaires and billionaires are awash in money, while the rest of the population can’t pay their mortgages, are taking pay cuts, and being told that their benefits are being cut. The problem is not a lack of money, but a need for redistribution of the wealth in this nation. You can watch Moore’s speech here or read it here. He was clear, uncompromising and to the point. What is happening in Madison is only the tip of the iceberg. As Moore and other speakers said that day, this is only the beginning of a long struggle to return some sanity and balance to economic power in this country (and I would add around the world). The scenario being played out in Wisconsin is being repeated in Ohio, Indiana and probably many other states. Unions will play a vital role in this struggle, not only in offering support (groups like the Teamsters, firefighters and police were not affected by the governor’s proposals but have been visibly present in solidarity), but also in their vast experience in bringing folks together to stand up to the corporate and political leaders who would seek to steal their right to self-determination and silence the voice of everyday folks. I see now why unions matter and expect that I will learn much more in the months and years ahead.